Senator Barbara Boxer observes two nurses demonstrating a bar code scanning safety procedure at Ronald Reagan UCLA Medical Center. Every year, 325,000 patients die in the United States due to medical errors, a number that would fill the Rose Bowl nearly four times, according to a special report released today at a UCLA news conference by U.S. Sen. Barbara Boxer. Boxer presented the findings of her report at Ronald Reagan UCLA Medical Center and noted steps UCLA already takes to prevent medical errors and that could serve as models for other hospitals around the country. "These deaths are all the more heartbreaking because they’re preventable," Boxer said after she toured the medical center with Dr. David Feinberg, president of UCLA Health System and CEO of UCLA Hospital System, so she could see for herself two systems being used to prevent medical errors. "This is not the time to sit back and do nothing. I will not turn away from this challenge when I have the opportunity to pull back 325,000 people from disaster every year simply by preventing medical errors." The third leading cause of death in the country, medical errors can be avoided by something as simple as washing your hands. These errors commonly result in hospital-acquired infections, bedsores, patient falls, adverse drug reactions, sepsis, blood clots, catheter-related urinary tract infections, ventilator-related pneumonias and surgical site infections. In addition to saving lives, preventing medical errors could save up to $19.5 billion annually, Boxer said. While touring the seventh floor, Boxer was first was shown the barcode technology and electronic medical records system used at UCLA to ensure patients receive the right medications in the right doses at the correct times. The process begins with a medication dispenser that operates much like a vending machine, providing one dose of drug at a time. A nurse logs in to the patient’s medical record to determine what medications are due and accesses them from the dispenser. Once in the patient’s room, a nurse logs into a bedside computer and scans a barcode on the patient’s armband that automatically opens up his or her electronic medical record. The nurse then scans the medication, which is individually wrapped and barcoded for that specific patient. If the medication’s barcode isn’t recognized as belonging to the patient’s medication profile, a warning will flash on the computer screen. After giving the patient the medication, the nurse selects the "administer" button, which instantly updates the medical record that the medication has been administered. 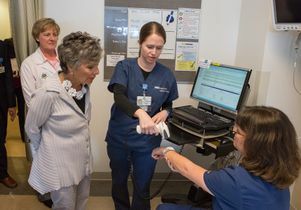 UCLA nurses were heavily involved the development of the barcode system, said Renee Appleby, director for the seven west cardiothoracic telemetry unit. The nurses first studied the errors to determine what was going wrong, and then participated in the creation of a safer system. Boxer called the barcode and electronic medical record system "exciting, an enormous change for the better," and said it must give the UCLA medical team more peace of mind. "As a nurse, it makes me feel safe," nurse Megan Kelly told Boxer. Prior to the installation of the barcode system, the medical center was making two to four medication errors a month. Since the new system has been in place, no medical errors have been made, Appleby said. That’s an impressive accomplishment, since the medical center dispenses five million doses of medication a year, said Cathy Ward, UCLA’s chief nursing officer. "You’re really doing everything you can to save lives," Boxer said. "Congratulations." Boxer then went to the seventh floor ICU to see the medical center’s ultra-violet disinfection system in action. The medical center has two Xenex machines, which can disinfect a hospital room in five minutes. The Star Wars-like robots use a Xenon bulb, a powerful form of UV light, combined with technology that generates high intensity pulses of light that are effective against 22 pathogens, including MRSA. "The light kills microorganisms by breaking down the cell walls of bacteria and fungus," said Dr. Daniel Uslan, assistant clinical professor of medicine in the division of infectious disease. "This is amazing technology that will help save lives," Boxer said. Feinberg said he is proud of UCLA’s commitment to patient safety and he looks forward to partnering with Boxer to find new and effective ways to ensure patients remain safe. The report was compiled after Boxer wrote to 283 California acute care hospitals asking them to respond with the actions they are taking to reduce medical errors. Of those, 149 hospitals responded. All of hospitals that responded reported taking at least some steps to address the most common medical errors, Boxer said. The report includes some common approaches to combating medical errors, such as using barcode technology and electronic health records to ensure patients receive proper medications to avoid adverse drug events. This technology is currently in use at Ronald Reagan UCLA Medical Center. Other common approaches to preventing medical errors in the report included maintaining hand hygiene, using central line anti-microbial port covers, assessing all patients for bedsores prior to and upon admission, assessing patients for blood clot risks preoperatively and elevating the heads of patients on ventilators from 30 to 45 degrees. Requiring all federal programs designed to reduce medical errors to work off a single list where appropriate, specifically the Partnership for Prevention’s list of the nine most common medical errors. Having the Department of Health and Human Services report to Congress the time it takes for quality measures to be developed, endorsed and implemented in programs related to medical error reduction. Creating a standard way of reporting medical errors, allowing hospitals and researchers to better collect data on errors, their frequency and where they are occurring. Evaluation of information collected by hospitals when assessing whether medical centers are meeting the requirement to track and report adverse events as a condition of participation in Medicare. Have Congress review the adequacy of whistleblower protections to ensure health care providers are able to report errors. Have the Office of the Inspector General examine the Hospital Patient Safety Initiative’s new surveyor tools and analyze their impact on increasing staff reporting of medical errors. "If we work together, we can prevent these needless tragedies," the report states. "If we ensure that doctors, nurses, hospital administrators, medical technology leaders, federal officials and patient advocates are all focused on this common goal, we can make great progress in preventing avoidable deaths and ending the epidemic of medical errors in this country."